Etelka Gerster was born in Hungary. She studied voice in the Paris studio of Mathilde Marchesi. In 1876, she made debut at La Fenice in Venice as Gilda from the opera, "Rigoletto." She first appeared as Her Majesty's Theatre in London in 1877 in the role of Amina in Bellini's opera, "La Sonnaambula," where she also performed in "Lucia di Lammermoor," "Rigeletto," and "The Magic Flute." Her first American tour in 1873 was with the cast of Her Majesty's Opera Company under the direction of James Henry Mapleson. She also appeared in San Francisco, where it was reported she became ill. 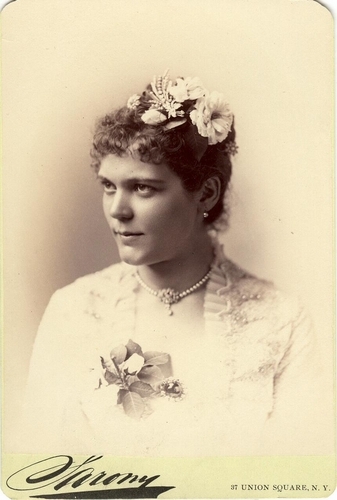 In 1884, she again appeared in New York working with Mapleson at the Academy of Music. Adelina Patti and Christine Nilsson, and Gerster were considered the leading singers of their time. Gerster opened a voice school in Berlin where she trained many famous singers from 1896 until 1917. Records indicate that the noted singer Lotte Lehmann was dismissed from the school for not adapting to the requirements of voice instruction.